I'm focusing on consistency--writing every day. I find that when I tell myself I only need to write three sentences, but I need to write those first (before doing whatever else it is I want or need to do on the computer), it is much easier for me to get past that initial resistance-to-writing and I usually write more than three sentences. So yay! I found something that works for me! YMMV and of course what works often changes, but if you're having trouble getting started, it's worth a try. It's still only January, but so much has kicked into gear for this year already! Some I can announce, some I can't yet. Several people have subscribed recently, and it is the beginning of the year, so I thought I'd give you a refresher on where else you can find me. I have not one, not two, but three email newsletters! Aswiebe's Market List - This one! A monthly update on new publications accepting science fiction, fantasy, and horror, along with a few of my favorite writing links. My teaching newsletter - Get notifications when I'm teaching classes or running free workshops in the Twin Cities area. Abra's Quarterly Compendium of Delight - A quarterly(ish) author newsletter with news of my publications, recommended free fiction, exclusives, and assorted other fun things. Subscribers also get quick updates when I have something new out. My author website is at http://www.aswiebe.com/. If you go there and click on "Stories," you will find links to read many of my published works. Some are free! I'm in the middle of building a new website that looks like it was made in the last decade, so pardon the plaster dust and redirects. I've been working on a grant application for an artist residency. As an SF writer, this is a tricky needle to thread, but it has jumpstarted the process of me creating an author website that looks like it was made in the past decade. Part of the application requires an online portfolio, so that is up and will exist for the next month or so. Three of my favorite stories are up there, free to read for a limited time, so go take a look! Happy Holidays! I hope you are having a joyful Christmas Eve, if you celebrate it. 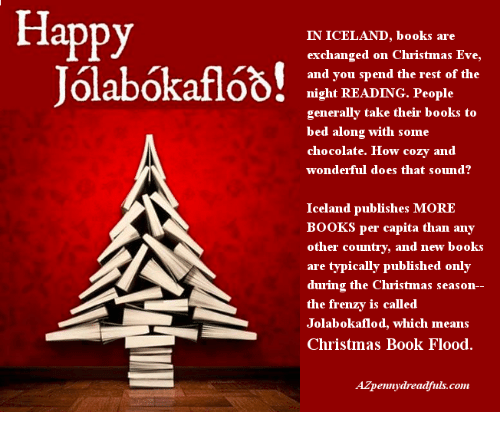 Me, I like Iceland's idea of Jólabókaflóð, the Yule Book Flood. In addition to our usual Christmas Eve festivities, I absolutely plan on settling in with some chocolate and a book this evening after the children are asleep. If you are reading this after the holidays, perhaps because you've chosen to unplug for a while, go you! I hope you feel relaxed and refreshed. And don't forget that ebooks are a great way to spend the last few dollars of that gift card you got, and novellas are particularly affordable. Here are the Nebula award nominees for novella this year and here's my small yet epic fantasy. I am embracing the idea of a writing session being a success even if you only write 3 sentences. It's removed a lot of the pressure, and so I feel less of an urge to procrastinate and end up writing more. Usually for me, it isn't the writing that's a problem, it's the starting to write. This helps, and I'm happy with how it's encouraging me to keep my mind in my project and to write every day. Because after all, I can do those ten urgent other things after I've written my 3 sentences, and if I feel like writing more once I get started (I usually do), then those ten other urgent things can wait a little longer. New pro themed anthology! Five Minutes at Hotel Stormcove wants all genres, pays $.06/wd. Stories must meet two basic criteria. First, they must take place over the span of five minutes. Second, they must take place at a specific era, location, and time of day within the rooms or grounds of the Hotel Stormcove. In order to maximize ease of writing across genres, we are not adhering to a strict Earth location and timeline. Contemporary writers will find the current hotel equipped with modern amenities. Historical fiction writers would be best writing generic stories in an era, but not based on specific local events. Fantasy writers may find low or urban fantasy easier with this theme, but I don’t doubt your ability to work in high fantasy elements and hope you will enjoy the challenge. And steampunk writers, well you can stage a whole mechanical speakeasy in the cocktail lounge. Mystery has the gift of finding a dead body in the hotel room, but you know, have fun with it. And so on. Basics: all genres--themed, under 4,000 words, no reprints, pays $.06/wd, due 1/31/2019. Guidelines: https://www.atthisarts.com/stormcove/. This past week the kids had off from school, so our family headed to a cabin in the wilds of Wisconsin. No internet, no cellphone signal ... perfect. I didn't even burden myself with, "I should be writing a lot." It was the perfect way to get out of my own head and unwind. I enjoyed the autumn splendor, went for long walks in the woods, and read two books. Now I'm back and feeling less stressed and more connected, in a good way! I have a short story in the next issue of F&SF, available at fine bookstores on November 1st. My inner 13-year-old is SO happy right now! And I've been preparing for readings at a couple of big events coming up. Next Sunday I'll be performing at WordBrew, an annual showcase for Minnesotan F/SF writers. It's always a great time. Check it out if you're in town! November 17th will be the grand book release party and fairy-themed extravaganza for The Subverted Fairy Project, an art and writing collaboration that I am part of. It's going to be amazing. Mark your calendar now! I am deep in the pre-production for my epic fantasy novella, The Unkindness of Ravens. During my final grammar-and-typos copyedit, my proudest moment was spotting the extra space hiding at the beginning of a paragraph. Want to know what gave me the most trouble? Figuring out the grammatically correct use of articles with a term I made up myself (turns out it's complicated). Ah, writers. We do it to ourselves. See above. I have a novella coming out soon! July 17th! Soon, The Unkindness of Ravens will be available in print for pre-order. The ebook is already available for pre-order on non-Amazon sites, with a special low pre-order price (Kindle coming soon). I'm also going to two local writing conventions in the next month. I'm at 4th Street Fantasy, June 22 - June 24th (I'm there now!). And I'm at CONvergence July 5 - July 8. I'll be doing a reading (with donuts if they're allowed in the room) first thing in the morning on Friday! That same day I'll be on these panels: Kids Ask a Writer, Keeping Creatively Energized, and Next Big Monster. On Saturday, I'm part of the group book signing (look for my origami tree) and the Writing Violence in Violent Times panel. Sins and Other Worlds is a reprint dark SF anthology by Shacklebound Books. All submissions must be science fiction in nature. Any sub-genre is acceptable, but the stories must have have a science fiction element and must be dark in tone or atmosphere. Basics: dark science fiction, reprints ONLY, 1,500 words or fewer, pays at least $.01/word (maybe more depending on Kickstarter). Due until filled. Guidelines: https://shackleboundbooks.wordpress.com/submissions/. New Aswiebe's Market List update! I talk about feeling stressed and miserable and realizing that a lot of the reason why is that ... I haven't been writing. New Aswiebe's Market List update! Unidentified Funny Objects 7 will pay you $.10/word for your funny SFF. But wait, there's more! Pie Charts of the Dead! Tax changes for writers, book giveaways, a contest for teen writers, and more new writing market updates! New Markets Update Nov 2017: If This Goes On political SF anthology & more! Book Smugglers is open for awakenings-themed submissions! Update! Intelligence in Fiction Wants Thoughtfully Written AI Stories. As a panelist at conventions, I am fortunate enough to be put in a position where I need to intensively study a certain story-related question. It changes my reading list. It changes the way that I read my reading list. It changes the way I read things that are not on my reading list. Maybe you're not on any panels. Maybe you don't go to conventions. You can still benefit from a narrow focus on the topic. Find a nearby convention, choose a panel that you're interested in, and plan as if you're going to be talking on that panel: questions, observations, and reading lists. You may be surprised by how much you gain from this. I recently wrapped up a short writing project. I've gone back to working on my novel(s), except the next 6 weeks are full of conventions, related convention panel prep, and teaching classes. Classes! I am teaching classes! If you are interested in these, register. If someone you know in the Twin Cities area would be interested, please pass this information along. Register now!